Located inside the AAA Colorado Denver Tech Center Store, the DMV kiosk is a fast, easy way to renew your registration and walk away with your tabs! Simply scan your renewal postcard or type in your license plate number, pay your taxes and fees via credit card or check, and your registration and license plate decal prints immediately. Renew. Print. Go! Find another kiosk near me. "This thing is incredible. So easy and quick." 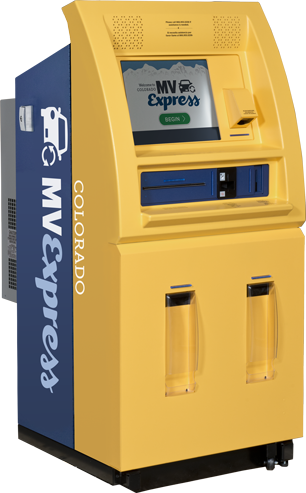 As part of Senate Bill 16-138, the Colorado DMV has been a full partner with Colorado counties in this self-service kiosk pilot program for motor vehicle registration renewal.